Do you enjoy having music in your home? 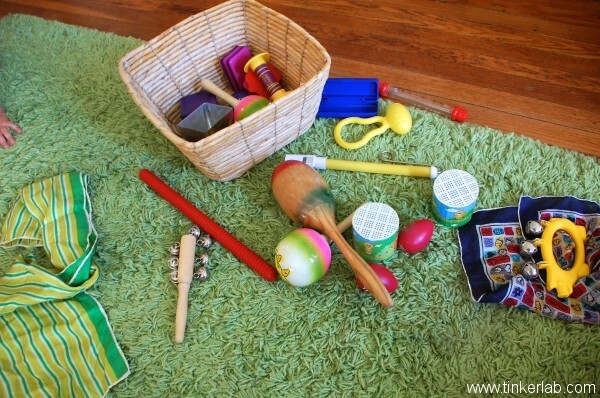 Do you have an instrument kit for your child to explore? If you do, I’d love to hear about what’s inside your kit. And if this is new-to-you, pull up a chair and let’s talk music! When my older child was just a few months old she got her first instruments — a few bean and bell-filled rattles. I suppose that they’re more noisemakers than musical instruments, but at a young age children love to explore the cause and effect of moving or pushing an instrument and hearing the noise it makes. Our kit has grown organically over the years, and just about any noise-making tool can go into it. I’ve weeded a lot of things out for the sake of saving space, and have kept a lot of our favorites. What goes into the Noise-making Basket? Bell Shaker. These are good for babies to shake, and these Wrist Bells encourage kids to get up and move. My older daughter fell in love with these when she was two and a half. Cowbell like this one. Just because our friends gave us one, and it sounds cool. DIY baby bottle rattle: Fill an old baby bottle with coins and tightly secure it with a flat bottle lid. Gluing the lid shut is suggested if you think your baby could open the lid. The Crafting Chicks made these shakers with beans. So cute! Silk scarves to dance and twirl around. Ours are from my collection, and you can find a selection of beautiful scarves at Sarah’s Silks. Slide Whistles like these are fun, and teach the child how to control the sound of an instrument. Clear Space. I usually start by clearing some space, just in case anyone is inclined to dance. In my house, the dancing doesn’t happen right away, but it’s almost inevitable. Turn on Music. Then I’ll turn on some music. We listen to a lot of children’s music and my kids have their favorites, so this is usually where we begin. I’ve tried introducing them to my music (and still do on occasion), but this is usually a sure way to kill their will to participate. Maybe if I had been better about diversifying the music from the get-go. Pull out the kit. 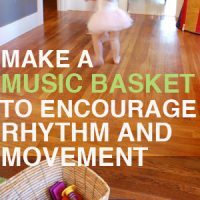 I pull out our music basket and gently shake it out onto the rug. Then I have to get silly. Dance around the room. I’ll pick up one or two scarves or a few maracas and dance around the room, waving the scarves or shaking the maracas to the music. They love this. This doesn’t require any special skills or talent (trust me — I’m a talentless expert at silly making with music). Have some costumes ready. My girls often race to put on dance costumes at this point. Maybe it’s just them, but it wouldn’t hurt to have some dance-worthy costumes ready just in case. Get up and Dance with Your Baby, from Christie at Mama OT. If you didn’t already guess, Christie is an pediatric occupational therapist, so she really knows what she’s talking about. If you like classical music, Prekinders.com shares this great list of classical music that kids will love. Debbie Clement’s whole site, Rainbows within Reach, is full of music-related ideas. Angelique Felix shares eight musical games you can play with children. Take the merriment outside and make your own Banging Wall like Soule Mama’s, this gorgeous music wall from Sue Nierman on PreK + K and Sharing. or this music tree from Filth Wizardry. Note: I share affiliate links to products we use and/or think you’ll find useful. If you purchase through those links we’ll receive a small percentage of the sale, which help keep our inspiration engine running. Thanks for your support!